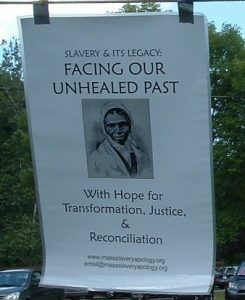 If you navigated to this page from massslaveryapology.org, please note our new URL. FACING OUR UNHEALED PAST, our statement of apology for slavery and commitment to restorative action, describes how our country’s history of enslavement and brutal racism lives on in the present. Recognizing that an apology is meaningless if not coupled with appropriate action, the statement makes commitments to meaningful change. We hope to bring this statement, as a petition for a formal apology for slavery, first to our Massachusetts state government, and then to other states. To date, more than 500 people have added their signatures to our statement! If you are of European descent and our words ring true for you, please consider adding your signature. Note to those visitors who arrived on this page via massslaveryapology.org: You have been redirected to our new site, racialjusticerising.org, and you should have been prompted by your browser to update your bookmarks. Please let us know if you experience any problems, at website@racialjusticerising.org.